The lathe lines that NCT has set up and installed are single cell lines that quality check each shaft after being machined inside a lathe. 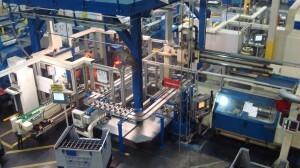 All of the part handling is done by an IRB 2400 ABB robot. The rest of the line includes an oiling station for rust prevention, a laser guage for quality control and a camera that checks for burrs or loose material.